Roma have continued their transfer spree by signing attacking midfielder Javier Pastore from French champions Paris St Germain on a five-year contract for a fee of 24.7 million euros (21.76 million pound). Argentina international Pastore, who was omitted from the nation’s 23-man World Cup squad, joined PSG in 2011 and has made 269 appearances across all competitions for the Ligue 1 side. The 29-year-old, who has 29 caps for Argentina, has won five French league titles along with 14 other domestic trophies with PSG. 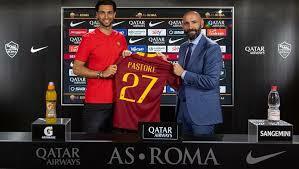 Pastore is Roma manager Eusebio Di Francesco’s eighth signing of the close season window and his arrival comes hours after the club signed defender Davide Santon and midfielder Nicolo Zanio from Inter Milan.